What has always bothered me about the gun control movement was the lack of any significant lobby that admitted the second amendment granted what amounted to an individual right and wanted it repealed. Now maybe these people exist but this has always made me a bit suspicious about the gun control movement. Note though that suspicion about the gun control movement is a very different thing than an opinion about whether well-designed gun controls save or cost lives (a topic I have yet to spend enough time on to have a strong position). What has always bothered me about the gun control movement was the lack of any significant lobby that admitted the second amendment granted what amounted to an individual right and wanted it repealed. The future car control movement is currently busy getting trans-fatty acids banned. But don't worry, car control is on the agenda, right after mandatory exercise. Even if I admit that the second amendment grants an individual right, and it's not obvious that I must, why must I then urge its repeal? It seems to me that lots of gun-controlling would still be constitutional even under your individual-rights view. The leading (only) appellate decision in support of the individual-rights model concedes as much. There are, for example, thousands of laws that restrict expression without violating the constitution. Morever, as our President has argued, much of the constitution might yield to his "commander-in-chief powers," especially during wartime. What better way to fight terrorists than have President HR Clinton round up domestic weapon stockpiles? I have a similar question for you. Why does your claim "logically make every single 'gun control' law ever passed by the Congress rather blatantly unconstitutional"? Isn't the possession of a AK-47 by a 3-time felon with a restraining order against him something like shouting fire in a theater? What Mr. Grossman doesn't mention is that in order to make a gun out of a flat that won't literally fall apart when shot, is that it needs to be bent into shape with the proper jigs, heat treated for hardness, and final machining done to insure proper fit of internal parts. In other words, this isn't something Joe Sixpack can do at his kitchen table. Certainly a qualified machinist in his shop could do it, but that same machinist could build such a gun from scratch. And as that site notes, it *is* legal to manufacture your own firearm if you follow proper procedures. "What better way to fight terrorists than have President HR Clinton round up domestic weapon stockpiles?" What better way to start the Second Civil War than have President HR Clinton round up domestic weapon stockpiles? 1. The American Revolution was started by British Gun Conviscation. 2. The Texas War of Independance was started when Mexician Army tried to take a Cannon in Goliad. The Texians flew a flag with a Cannon and the words "Come and Take it" on it. Only Democrats would be stupid enough to give the order to conviscate American guns. And Stupid enough to believe that their orders would be followed by the police let alone the Army. And finaly that the American gun owners would just give up their guns. Some would, many would just hide their guns, but enough would fight. They wouldn't become terrorist. But is it a good idea to piss off people that for fun shoot varmints at 400+ yards, that shoot .25in groups at 100 yards, etc. I don't think so. At the same time, I think that it is important to have these items on the radar. If we make a big deal about aluminum tubes, then why not take note of gun parts being sold? If gun sales and usages are restricted (and if you agree with restricting both those things) - it seems to follow that we should track the gun pieces too. You could argue that the flats can be used for other purposes, and the same argument could be made for those alleged centrifuge tubes. falsely shouting fire in a theater, perhaps? If guns were to be banned in this country, the consequences would be interesting. Armed insurrection? Maybe not on a widespread scale. Massive non-compliance? Almost certainly. People in both California and New Jersey will tacitly admit, if you press them, that the cosmetically-incorrect weapons bans both states passed were remarkable for the number of people who simply ignored them. If my memory serves, NJ estimated they had roughly a 1 or 2% voluntary compliance rate. Short of sending confiscation teams to every home in America, you simply can't get rid of guns. It may have worked elsewhere, but don't bet on it going over well here. Yes, asking questions is in my nature. Jeek "Well Dan, the average gun owner isn't stupid enough to shoot at the police or the Army"
You are very correct. But I bet they would be more than willing to shoot at Congresscritters and High government Officals. Also you assume that the Police and Army will follow orders to confiscate guns. In California and New York maybe but Texas and the West get real. And as T said non-compliance will be the NORM. Then you have the ATF comming in all dressed in Black and frankly I don't think that gun owners are going to put them in the same class as the Police and the Army. Gun owners know the ATF is full of jackbooted thugs and might be happy to turn in their bullets one at a time to them. I hope and pray that it NEVER happens. I hope that the Democrats are never stupid enough to try it. BUT the Second was put there for a reason. The Founding Fathers KNEW that ALL Governments had gone bad. They KNEW that history taught that Governments sooner of latter tried to oppress their people only ARMED Citizens can stop such oppression. Nobody wants it to happen but if history is right IT WILL HAPPEN. I believe that the New flag for the gun owners of American should be the Goliad, Texas 1837/8 the outline of a cannon barrel and under it the words "Come and Take it". Jiminy - The problem is, where exactly do you draw the line at "gun parts" ? The reciever flat referenced above is just a piece of sheet steel with some holes and cutouts. Anyone with enough machinery and equipment to make a receiver out of it, could, with little dificulty, take a piece of sheet steel and make the receiver from that. So do you restrict sheet steel? Steel billets? other raw materials? The truth is that anyone with some rudimentary machining skills, can, with some time, determination, and five to ten thousand dollars worth of easily available machinery (lathe, mill, etc.) make a full auto weapon from raw billets of steel. They couldn't make very many or do it very quickly, but it can be done. Darrin: you have started a sub-thread (followed by jiminy and jgalak) that seems to spring from some of Mr. grossman's materials, but these are not linked here; could you please provide a reference for the comment? Thank you. FYI: while the BATFE website notes that you can make your own guns, if you want to make an NFA firearm, you still have to get an FFL (even if it's for personal use, not sale). It may well be, but it isn't a prerogative of the federal govt to make and enforce such a law. Unless you can cite the connection to commerce there. My preference is to the Spartan "molon labe." Unless you can cite the connection to commerce there. Oh, hell, he's using ammo shipped in interstate commerce. Or the underpants of the person he's pointing the gun at came across state lines. Or something, anything. The bit about receiver flats is mentioned in Dave's linked review of Mr. Grossman's book. Well I watched. What a lying POS. Let me just point out a few of Grossman's lies or subtle rethoric. He taked about assault weapons and Machine guns in the same breath trying to make the ignorant think they are the same. When he said Arnold banned fifty caliber rifes he said they were automatics. He acts like the closing of his mystical gun show loop hole would have stopped Columbine. No they lady who bought the firearms would have passed a NICS check but of coarse he did not mention that FACT. He ignores the NY and CA have confiscated firearms. He acts like he does not know what is going on at the UN. He ignores his idea of safe storage would violate the 4th amendment but laments the Patriot Act how hypocritical. All I saw was a old leftist wanting to take people firearms because he thinks they are bad and he says he trusts the Government. I say BS. If he was not a black helicopter guy himself he would have not problem with the Patriot Act. He also ignores that the Brady Bill has not decreased crimes with firearms while giving the number of firearm purchaces that were denied as fact that gun control laws have worked to decrease crime. He made me ill and ANGRY. Then he paints the NRA as racist then denies he did so. Then he uses the well known tactic of all leftists by giving emotional sob stories to further his propaganda with a last dance on the graves of the dead for his poticial agenda. And I mean political agenda not his fake worry about gun violence. He is a fraud and a hater of FREEDOM. I'm going to go outside and shoot off a few 100 rounds to spit in his face and calm down. I am mentally cussing in my mind as a southern lady does not do that outloud!!!!!!!!!!! LOL. He also appeared like a Cobra wanting to strike with anger he was suppressing. He did do a good dog and pony show that would convience the uninformed and emotional. I don't know what he considers "a" firearm. every piece on a firearm can be purchased freely, except the receiver, which is the part of a gun that is considered "the gun", and it carries the serial number in full. the receiver is sold as if you were buying a complete weapon- so a backround check has to be made, and if it is shipped, it has to be shipped to another dealer. I don't know what the malarkey about the "firing mechanism is". Too bad Kopel didn't know what a "[receiver] flat" was, he could have done a better job of refuting this particular part of Grossman nonsense. lengthier article on the entire process of building an AK from a flat. The "loophole" of every gun control law and regulation is that private citizens are still permitted to own firearms. Yet Grossman and his ilk believe that women are too stupid to weigh the risks-vs-benefits of owning and/or carrying a handgun for self-protection, and therefore must be denied the right to make that choice. That attitude displays so much of what is wrong with the so-called "pro-choice" movement. When was the last time you heard a so-called "pro-choice" politician say something like, "While I am personally opposed to personal firearms ownership, I would never restrict a woman's right to choose to own a gun"? It's obviously news to some politicians and lobbyists that when people are allowed to make choices, people might actually choose things they disagree with. 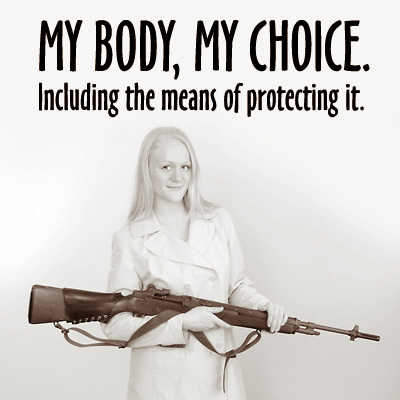 As photographer Oleg Volk observed, the phrase "My Body, My Choice" also includes "the means of protecting it." If you try, not "Second Amendment Rights" but "2nd Amendment Rights" the third result in my Google window is www.apfn.org/apfn/mmm.htm, the American Patriot Friends Network. I have a quite high threshold for calling people racist, but these guys probably qualify. This has nothing to do with the NRA, of course, and remains Grossman's fault, not yours, especially if he typed "2nd" into the search engine and wrote "Second" in the book.